While by no means scientific, the exercise nevertheless highlighted a serious industry issue, one forced into the forefront by recent regulatory declarations in arguably the country’s most important market. The California Bureau of Automotive Repair and California Department of Insurance in fall 2018 said no parts should receive terms like “Opt-OE” on an estimate. The state of California doesn’t recognize the category, and it might be misleading to consumers, both agencies stated. For the BAR, this position technically wasn’t anything new — the agency just emphasized the point and rewrote regulations to make its longtime stance clearer. But apparently, the larger industry failed to take the BAR seriously or have a hard look at state rules until this fall’s developments. 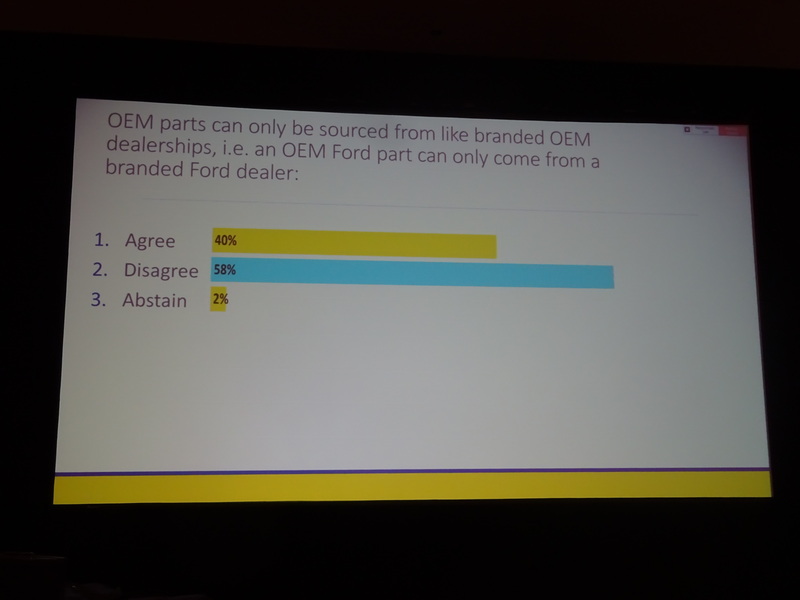 Despite the turmoil following the regulators’ decisions, the CIC Parts and Materials Committee session and poll of the audience of repairers, insurers, suppliers, consultants and others indicated the officials might have had a point regarding parts confusion. Peevy said he wanted a “strong committee” collaborating with the Collision Industry Electronic Commerce Association and the CIC Definitions Committee on the issue. 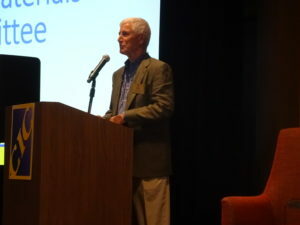 Weiss said he had been “very vociferous” in his opinion regarding the “chaos” of parts definitions, and he wanted to find an industry-accepted solution. “We need consistent terminology,” Weiss said. An OEM part should mean the same thing to everyone, he said. 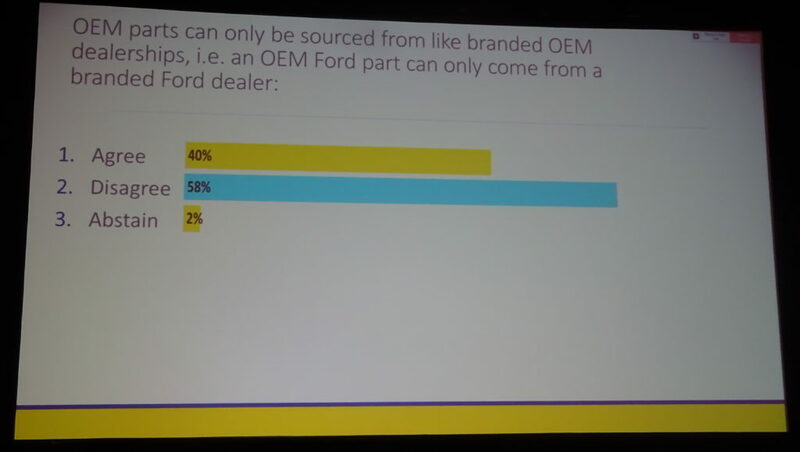 A slide from his presentation listed a goal of all estimating and parts procurement platforms to adopt “identical terminology” on parts types. Weiss said this uniformity currently didn’t exist. “Different platforms should not be using different terminology to describe identical parts types,” the slide stated. An OEM part must be manufactured by either the OEM or an OEM contracted manufacturer. 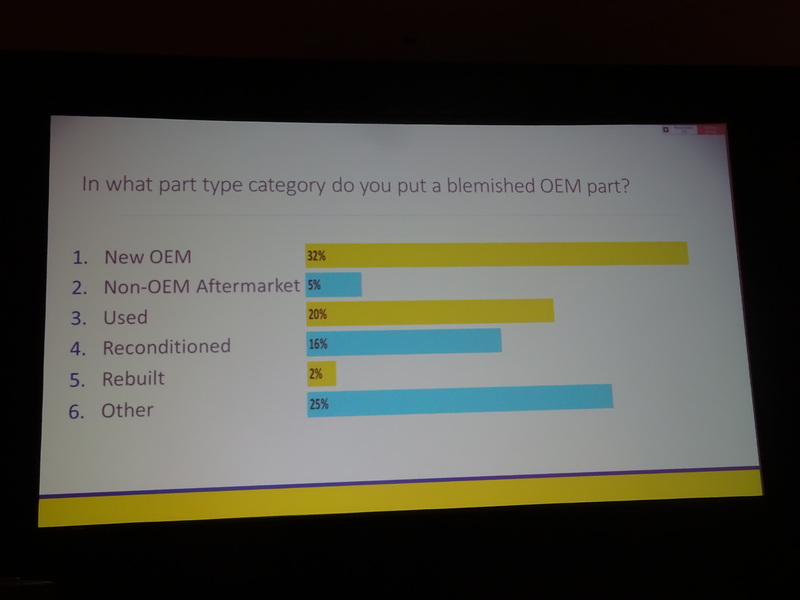 In what part type category do you put a surplus OEM part? 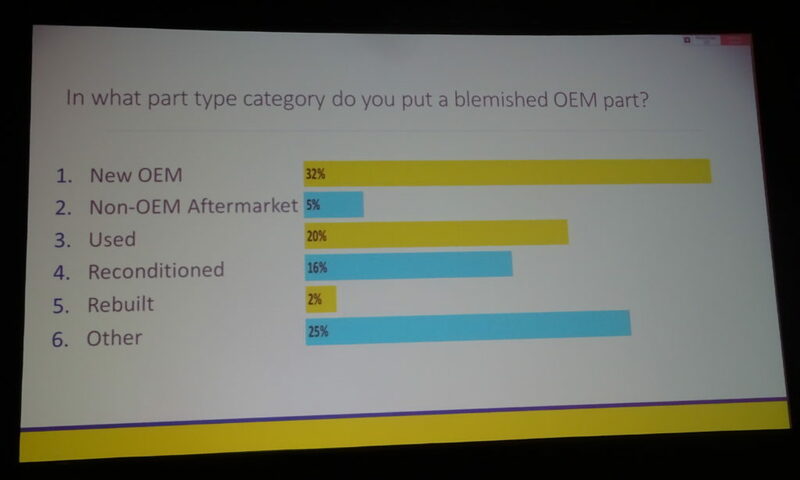 In what part type category do you put a blemished OEM part? In what part type category do you put an OEM take off part or assembly? In what part type category do you put an OEM manufacturer’s private label part, i.e. a BMW part engineered by Bosch for BMW sold in a Bosch box? He said Peevy was concerned about asking questions about definitions lacking consensus. “I said, ‘That’s exactly what i’m trying to point out,'” Weiss said. “Clear definitions” the industry accepts and which were consistent across platforms were necessary, he said. Weiss said he wanted the audience to hold estimating services and parts platforms accountable to provide a complete list of their parts categories and definitions to build a spreadsheet. Repairers and insurers needed to take the lead on the issue, according to Weiss. But input from suppliers, estimating systems and part platforms and CIECA also was needed. Executive Director Fred Iantorno said CIECA, the industry’s neutral electronic standards organization, had codes for part categories and subcategories. “We can manage the codes,” he said. CIECA just needed the definitions from the industry, he said.